Destroyer (film, 2018). A 2018 American crime film with "R" rating by Annapurna Pictures. Directed by Karyn Kusama. Official Trailer. Destroyer is a 2018 American crime film directed by Karyn Kusama. LAPD detective Erin Bell arrives on the scene of a John Doe murder and informs the responding officers that she knows the identity of the murderer. At the police station, Erin receives a $100 bill stained from a dye pack in an unmarked envelope. Using a contact at the FBI, she confirms that the bill is from a bank robbery committed by a California gang many years prior that she and her former partner Chris were embedded in as undercover officers. She tells her superiors that she believes the bill and the John Doe murder to be proof that the gang's leader Silas is once again active. Erin is forced to work her way through the remaining members of the gang in order to find Silas. She begins with Toby, who was arrested but is now gravely ill and living with his mother on compassionate release. She manually stimulates him in exchange for the location of Arturo, a member of the gang who attempts to atone for his past crimes by offering pro bono legal services to immigrants. Arturo provides Erin with the location of Dennis DiFranco, a lawyer who launders the money from the original robbery and from whom Erin deduces that Silas is active again because the money from the heist is almost gone. After threatening him, DiFranco gives Erin the location of the next money hand-off, which is performed by Silas' girlfriend Petra, who has developed a severe drug addiction. Erin tracks Petra, eventually intervening in a bank robbery committed by Silas' new gang, and kidnaps Petra. Flashbacks reveal that Erin and Chris developed a romantic relationship while undercover, with Erin eventually becoming pregnant with Chris' child. At Erin's behest, they decided to become legitimate participants in the bank robbery and planned to take their shares of the heist, report to their superiors that they lost contact with the gang, and eventually quit the force. The robbery was botched when a dye pack exploded in one of the bags, and Silas killed the bank teller who accidentally placed it. When Chris attempted to intervene, he was shot and killed by Silas. After crashing the van in a dumpster and seriously injuring Toby, Erin hid her share of the heist and returned to policing, disclosing neither her original plan nor her share of the heist. 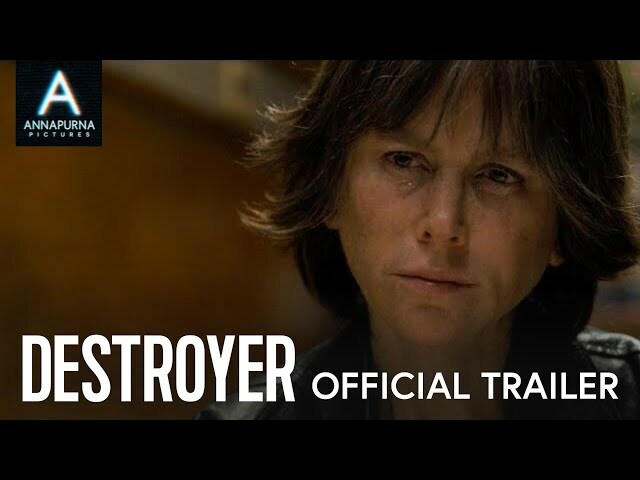 The film Destroyer was scheduled to be released by Annapurna Pictures on August 31, 2018 (Telluride), on December 25, 2018 (United States), on January 25, 2019 (United Kingdom, Romania) and on March 14, 2019 (Germany). The duration of the film is 123 minutes. With a budget of $9 million, the film grossed over $5.5 million. Destroyer got high rating from critics. The audience also likes the film.